"Home is Where the Air Force Sends Us". All Air Force families know this saying and how true it is! This little stitchery will be perfect on a shelf or cabinet top in your home...and at all the places to follow! What a wonderful gift for family and friends or as a special gift for someone who is transferring to their next assignment! These little stitcheries are unique and different and will bring a smile each time it's unpacked and set out at the newest destination! The saying is a printed coffee-dyed fabric tag and hand-stitched on a background of ABU fabric. The fabric is sewn with a layer of quilt batting to add texture and dimension to the stitchery. It has been framed in a handcrafted black wooden frame (made by me) and then sanded to add to the rustic country charm of the stitchery. Additionally, a sawtooth hanger has been added to the back for your convenience, if you wish to hang the stitchery. 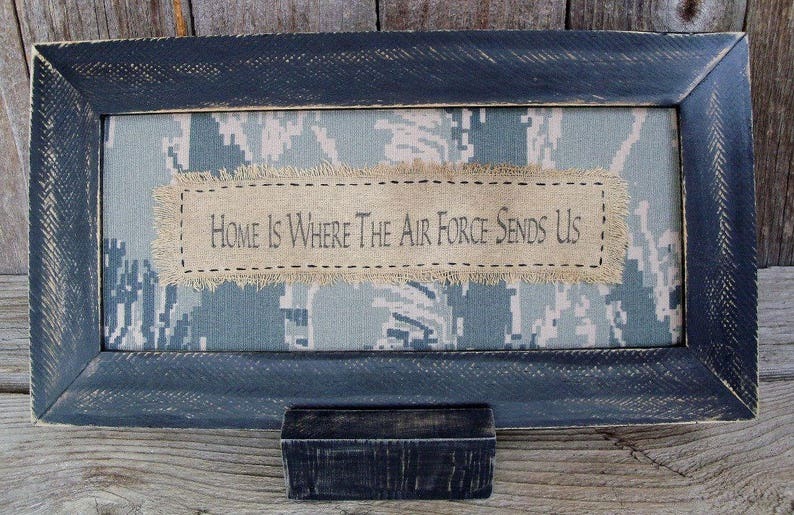 "Home is Where the Air Force Sends Us" measures approximately 7 inches high (17.78 cm) x 13 inches long (33.02 cm). Shipping to US addresses (including FPO/APO) will be via USPS priority mail *insured*. --- Please allow at least 7 - 10 business days for your stitchery to be completed and mailed. - a YLP ragg tagg is used.